Welcome to Turkish Cooking, Everyday. There are many things I will share with you about the average Turkish Kitchen, People and Culture. I thought a good way to start this blog would be to explore a bit of the Turkish Culture and some of the rituals associated with it. Tea drinking can be a very formal event or an everyday one where you drink tea after dinner with family or as an event at a women's tea afternoon. Tea is drunk out of little glasses in the shape of tulips and is always served with 2 lumps of sugar. Tea is served from a 2 tiered pot, the bottom pot is where the boiling water is placed and the top pot is where the tea is brewed. Once the tea has brewed to your satisfaction you pour it into the glasses and then dilute it with the water in the bottom pot. In the evenings after dinner when everyone is relaxing usually tea is served. It is served by the woman of the house or the youngest child, especially if that is a girl. The teapot itself is either left on the stove to keep hot or left on the tray besides the server to be poured out as soon as an empty glass is seen. For the Turkish people coffee has been an established part of their culture since 1555. It was in that year that Syrian traders brought the first coffee beans to Istanbul. Beans were eaten whole at first. It was not until much later that a drink was made with the fermented pulp of the beans. 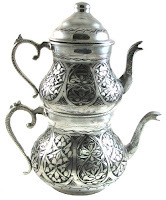 As the recipes became more developed so did Turkish rituals and ceremonies. Soon coffee makers (or "Kahveciusta") and their forty assistants were depended upon by Sultans to serve a proper brew. As Coffee became more socially acceptable men began using it as their assessment for a quality wife. Women were trained at an early age to prepare Turkish coffee. If she wasn't able to do so, she risked her dowry. I was once at my friends house and she apologised to me saying my visit would be interrupted by a group of ladies who were coming to check her out as a 'would be' daughter in law. Yes I was just as surprised as you are readers. The group of ladies came it included the Mother in law - friend of the Mother in law and the woman who knew the girl to do the introductions. Now this is an old tradition and one that is alive and well today. The ladies sat down in the formal lounge room and introduced themselves to each other and myself. After that the 'would be' daughter in law goes to the kitchen and makes the coffee to give to the women. As the tradition goes the coffee has to be perfect because the girl is judged by it's merits. I was just about to join the conversation when certain gestures from the kitchen were made in my direction. I hurried into the kitchen where the girl was nearly in tears, she explained to me that her sister always makes the coffee in their house as she is very good at making it (yes she is I have drunk it several times) but she wasn't available to do it so I was asked to do the honours as my friend had never made it before. I objected and said doesn't that smack tradition in the face? My friend smiled and said they will never know. So I agreed and made a perfect cup of coffee, as my ' future Mother in law' commented. So Readers what cultural pho pah's have you made in order to keep tradition's in the balance? This is a really great post - keep them coming!!! My Thai cooking teacher told us that in Thailand the young women were judged by their ability to slice lemongrass. The finer the slicing, the better the chances of marriage. So when the matchmaker and M.I.Laws would come around, she would slice the lemongrass according to how much she liked the boy. If he wasn't her type she would slice it very chunky! I drink tea but I take coffee. I love tea in all its guises - black, green white, flavoured, tisane etc etc. But coffee... I must admit that I struggle with the over sweet and over strong. I was once honoured with a glass of mud thick coffee in the Balinese highlands and, despite my best efforts, just couldn't finish the drink. I had to dispense with the dregs as surreptitiously as I could and hope they didn't notice as I had no wish to offend! 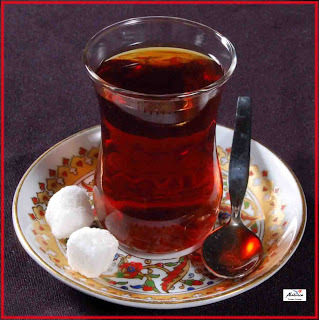 Hi Michelle, I enjoy the occasional cup of turkish coffee. I think that Greek, Turkish and Arabic coffee is all very similar even though they are made differently. One day one of my children will bring me a cup of tea and I will most certainly enjoy it. @Intolerant Chef, you would have to hope that the Thai Matchmatcher wasn't visually impaired. @Sutea I would say I am a tea drinker...I love coffee but I contain myself as if I let myself go and drink several cups of coffee I find myself ending up with the shakes. Therefore moderation is the key. This is an awesome page and so many people should learn this stuff. It's yummy!!!! thanks to Simcha!!!! I tried to make Turkish Coffee during my trip to the Bodrum area earlier this year. I had multiple attempts, but I just couldn't master the froth. And it didn't takes like the coffee I'd had in the cafes. There is definitely an art to it. The trick is not to stir it, you do all the stirring before you put it on the stove then you just let it come to itself all by itself.